Seventeen per cent of UK parents have let their children drink alcohol by the age of 14, according to new findings from the Millennium Cohort Study. 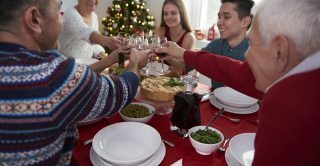 As the festive season approaches and wine is often shared at the dinner table, the study’s authors were keen to point out that while having better educated parents is generally a protective factor for children, previous research has shown that those who start drinking early are more likely to fail at school, have behaviour issues, as well as alcohol and substance problems in adulthood. Analysing data on more than 10,000 children born in the UK at the turn of the new century, the researchers examined reports of parents’ drinking habits and attitudes to drinking, linking these to information on family structure, employment status and parents’ educational attainment. The report, which is published on Friday (15 December), reveals that parents of white children who were employed, had more educational qualifications, and who drank alcohol themselves, were more likely to allow their adolescent children to drink than unemployed parents, those with fewer educational qualifications, and ethnic minority parents. By age 14, almost half the children said they had tried more than a few sips of alcohol; three years earlier only about 14 per cent had done so. Katherine Brown, Chief Executive of the Institute of Alcohol Studies, said: “The Chief Medical Officer recommends that an alcohol-free childhood is best, with children not drinking any alcohol before the age of 15. This is important guidance because alcohol can harm children given their bodies and brains are not yet fully developed. ‘Parents who allow early adolescents to drink’ by Professor Jennifer Maggs and Professor Jeremy Staff is available online on the Journal of Adolescent Health website. When study participants were age 14, their parents were asked, “Do you allow [child’s name] to drink alcohol?”. No further questions were asked about the timing, context, or reasons underlying drinking, eg, whether it was supervised by parents or other adults, how much alcohol was allowed to be consumed, or whether parents allowed their children to drink with their peers. Parental educational level was measured using National Vocational Qualification (NVQ) levels from 0-5. (NVQ level 0 – No qualifications. NVQ level 1 – O‐levels grade D or lower, or CSE grades 2‐ NVQ level 2 – O‐levels grade A-C, 2+ AS levels or 1 A level. NVQ level 3 – More than one A level. NVQ level 4 – Teaching Diploma, PGCE or Degree. NVQ level 5 – Higher degree).